is a tip I was moved to share after getting many a few request from our steady readers who accesses this blog via Mobile Devices. This is 2013 responsive design is the way to go which actually motivated me to share this tips for some that might be interested in implementing ads for the mobile version of their wordpress blog or website. Almost all popular mobile ads serving Networks such as google adsense, addynamo, adtwirl.com, inmobi.com, chitika and yahoo-bing media.net have got a well optimized code for monetizing your mobile traffic. 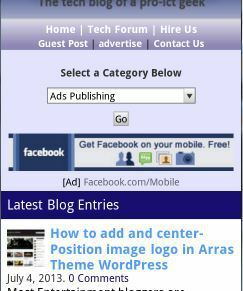 By default your normal adds will show in smartphones and tablets if you are using a responsive wordpress theme so you will only need this tweak if you want the ads to be displayed to low end (feature) mobile phone users, In that case you will need create an add unit for low end phones only from your ads serving network dashboard. Then edit the single.php of your theme or simply use the “quick adsense” plugin or “simple hooks” Plugin for genesis framework users to implement your adds . Really nice article I just have a question that if I’m using a wordpress responsive theme and widgets from it’s sidebar appears at the bottom when I view my site on Smartphone so if I ever put an ad on my sidebar will my ad be still displayed at bottom. Nice step by step guide.. i know someone will find it useful. This tip will definitely increase earning, either AdSense or AdSense likelihood since most blog visitors this day make use mobile. This is realy a nice post from you buddy.Will help adsense publishers like us a lot to increase the revenue from the mobile template as well.